Zoe wanted to start the new year with new devotional books, so we picked up two. One of these we are reading after dinner. It is Jesus Calling: 365 Devotions for Kids. 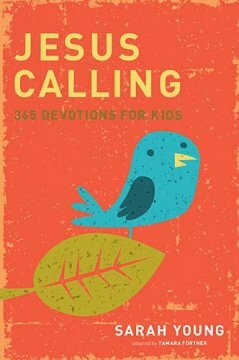 Mark and I would like to rename it: Jesus Calling: 365 Devotions for Kids to Read Aloud while Their Parents Cry. We are obviously not far into the book, but each devotional has hit home. Yesterday it was about being patient with God’s timing. I tried to keep reminding myself of that today as I received my new chemotherapy, Halaven. Halaven will likely give me more fatigue and nausea and maybe some more hair loss. However, Halaven also gives me hope that the fluid production in my lungs will slow and that I’ll be able to be done with it once and for all with a pleuradesis (sp?) procedure. I am still producing over a liter a day of nutrient-leeching fluid and blood. My mornings are the worst as I try to make up for the fluid lost in the night. I must force myself to eat and drink. Usually by late afternoon and evening I am up and about, if a bit drained. My parents stay with me throughout the day doing all that needs doing and more. They are shouldering our burden exceptionally. There aren’t words of gratitude that suffice. And if my earthly parents are doing this for us, what must my heavenly parent be doing? I imagine God is telling me to be patient and that things will happen in God’s time, not mine. As I was settling into my chair for chemo today, I got a text from a former student. It said, “Praying for you today, Mrs. Turner. Remember God is in control.” I wonder if this was Jesus Calling again. Love, love, love that book!!! The Jesus Calling for adults is very good, too!!! I have that book too as well as a whole network of friends reading it day by day. It is such a comforting book. I also bought Dear Jesus to read when one devotional isn’t enough. praying for you, today and always. Terry and I read the Jesus Calling book together each morning! It is amazingly wonderful and I gave it to our three daughters this Christmas!! Praying for you my dear! I read all your posts and am in awe of your frank but hopeful take on life. Now that we are dealing with cancer again, I empathize even more. What a blessing you are to us! Hoping for relief for you soon, sweet Tash. You are blessed with great parents and Zoe and Mark. Thinking about you and sending healthy vibes. Tasha, you are back at the top of my prayer list. I pray that the pleuradasis (sp?) is successful, and th atthe new chemo is gentle on you and sooo tough on the cancer.